Agriculture is important in India for the obvious reason of its centrality, given that it accounts for a large share in GDP (16%), and an even larger share in employment (49%). Perhaps it is even more important because, as the experience of the last few years illustrates, it has the potential to hold back Indian development: poor agricultural performance can lead to high inflation, rural distress, and political restiveness. 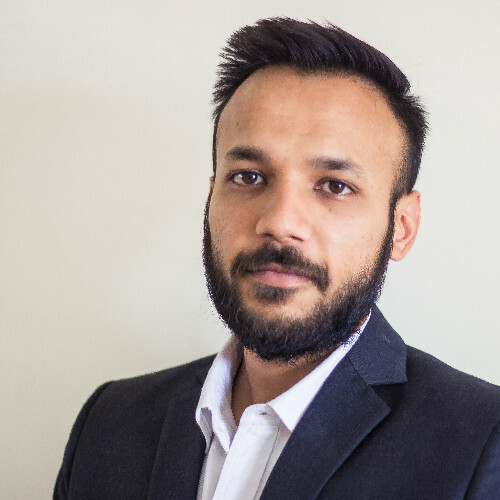 Agriculture in India continues to remain vulnerable to the vagaries of weather, and the looming threat of climate change has the potential to expose this vulnerability further. A small but growing literature has focused on estimating the impact of weather and climate on economic performance. However, most of these are either cross-country studies, or focus on developed countries, primarily for data reasons, and therefore may not be applicable to a large, climatically diverse country such as India (Deschênes and Greenstone 2012, Dell et al. 2012, 2014, IMF 2017: Chapter 3, Burke et al. 2015). There are a couple of important exceptions. Guiteras (2009) finds that crop yields will decline by 4.5-9% in the short-run (2010-2039) and by a whopping 25% in the long-run (2070-2099) in the absence of adaptation by farmers. Further, Burgess et al. (2014) find that a one standard deviation increase in high temperature days in a year decreases agricultural yields and real wages by 12.6 % and 9.8 %, respectively, and increases annual mortality among rural populations by 7.3 % in India. 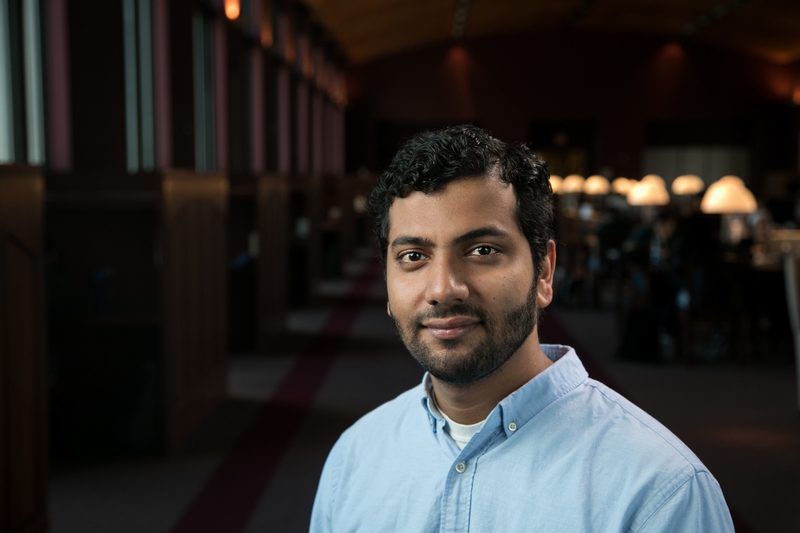 By contrast, in urban areas, they find virtually no evidence of an effect on incomes and a substantially smaller increase in the mortality rate. Our study brings to bear new data (covering a longer and more recent period, larger geographical area, and more spatially disaggregated) to analyse the impact of weather shocks on agricultural productivity in the short run, and that of climate change in the long run. We also consider possible policy options to reduce vulnerability in Indian agriculture. What have been the trends in rainfall and temperature over the past four and a half decades? 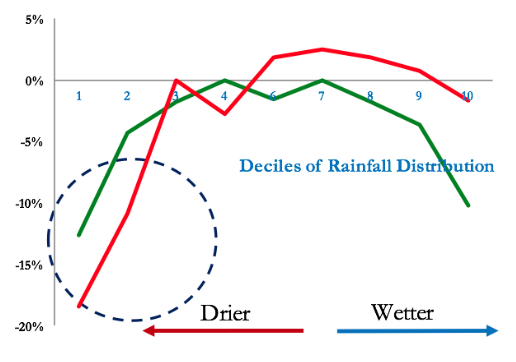 What are the average effects of rainfall and temperature on agricultural productivity? 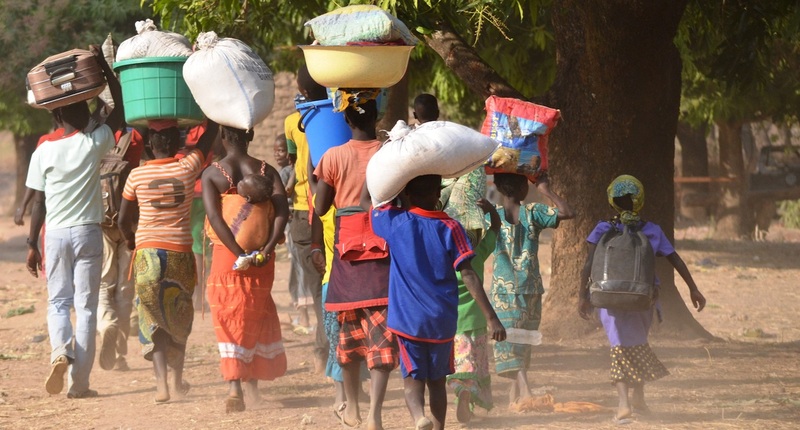 To what extent can irrigation mitigate these effects? How significantly will climate change affect agricultural productivity? Another reason to undertake the analysis relates to data quality. Raw data on temperature and rainfall are recorded by ground weather stations, which are spatially interpolated into standardised grids. The Indian Meteorological Department (IMD) maintains data for more than 6,000 rainfall stations and around 300 temperature stations. Existing studies on India involving rainfall or temperature data primarily use one of the following data sets: the Global Human Climate Network (GHCN) maintained by the National Oceanographic Association of America (NOAA) at NASA or University of Delaware Precipitation Climatology. 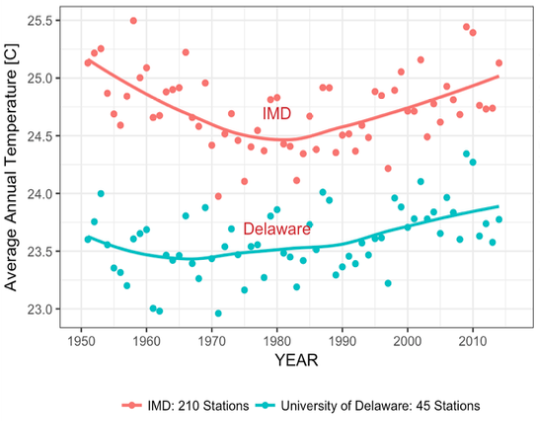 The raw data for all these data sets are sourced from the IMD but rely on far fewer weather stations; for instance, NOAA procures data for only 45 temperature stations across India. India is a climatically diverse country with the third highest number of climate zones (16 Köppen classification) globally. Fewer weather stations limit the accurate understanding of local weather variations. Our analysis uses the universe of weather stations available to the IMD and is therefore more representative of actual weather patterns. This distinction turns out to have crucial implications. 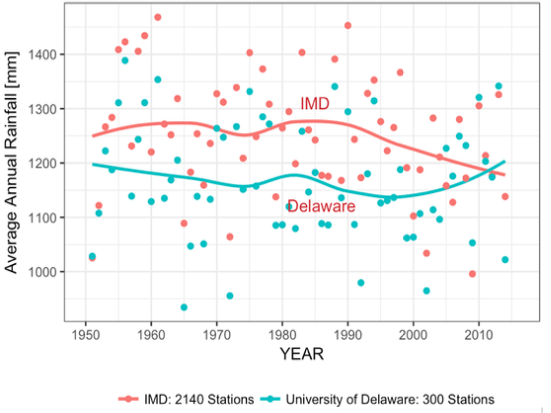 As shown in Figure 1, IMD data report significantly higher average temperatures (by 1 degree Celsius) and higher average rainfall (by about 100 mm per year) compared to the University of Delaware data set. Any analysis of climate change and its consequences are therefore likely to be very different across these data sets. Average annual temperatures have risen by around 0.48 degrees (between 1970 and 2016), and average monsoon rainfall has declined by 26 mm (between 1970 and 2016). We also find that there has been a steady increase in temperature extremities. 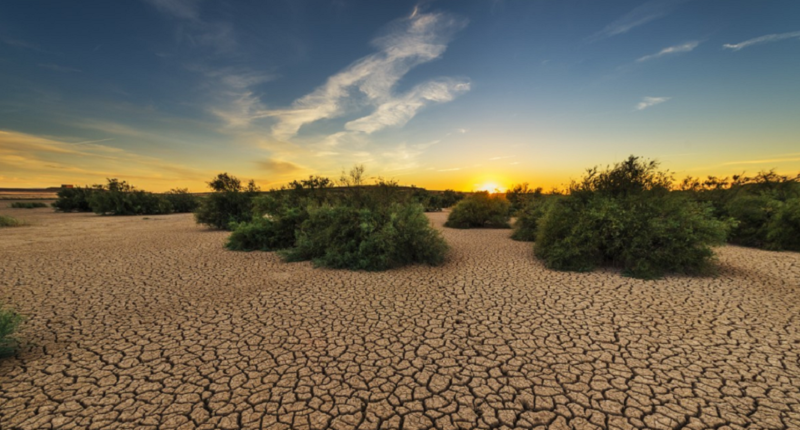 The number of “very hot” days as well as the number of dry days has increased, consistent with models of climate change which predict increased variability in weather. Next, we turn our attention to the effects of these changes in temperature on agricultural output and yields. A simple correlation at the district level, say between average temperature and average agricultural productivity, will not yield the causal effects of interest. For example, if we find that hotter districts have lower average productivity, it could be because of temperature, but it could also be because of several other factors correlated with temperature – soil quality, availability of water, and so on. Our approach, instead, is to use year-on-year fluctuations in a district’s rainfall and temperature to identify the effects of weather on agricultural productivity. Such an empirical strategy does not compare hot districts with cold ones, or dry ones with wet ones. Instead, it looks at how agricultural production in the samedistrict changes when rainfall and temperature in that district change. We then combine these estimates with projections of temperature and rainfall from climate models to predict the impact of climate change on agriculture. For this analysis, we combine the ICRISAT district-level database with data from the Ministry of Agriculture, Government of India, to construct a district-level panel on crop production, land use, yields and irrigation, covering the period 1970-2015. We conduct the analysis for each cropping season separately, and our key findings are illustrated in Figures 2 and 3. In these figures, the x-axis plots deciles of rainfall and temperature with the 5th decile being the omitted category against which all comparisons are made. So, if a district’s temperature were in the 10th decile (i.e. the hottest possible), Kharif yields (from July to October) in irrigated areas would be 3% lower than if the temperature was normal. This number rises to 10% for un-irrigated areas. Similarly, if rainfall was in the 1st decile (i.e. the driest possible), Kharif yields in irrigated areas would be 13% lower than if rainfall was normal, and this number rises to 18% for un-irrigated areas. Source: Survey calculations from IMD and ICRISAT data. The effects of temperature and rainfall on crop yields are highly non-linear, and felt almost exclusively in the extremes. “Moderate” shocks such as temperature in the 7th decile or rainfall in the 3rd decile have little or no effect on crop yields. There is large variation (heterogeneity) between irrigated and un-irrigated areas – irrigated areas are far less susceptible to weather shocks. 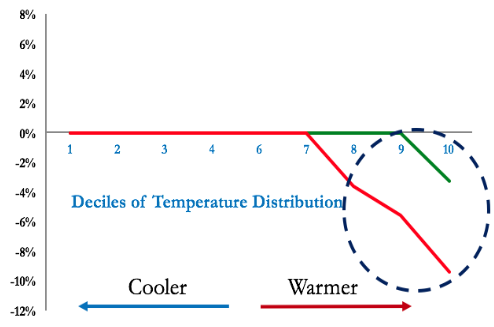 This is illustrated by the fact that for a majority of instances the red line in Figures 2 and 3 lies below the green line, especially at the extremes of the temperature and rainfall distribution. The relationship between weather and agricultural production is governed by factors other than just the level of temperature and rainfall. 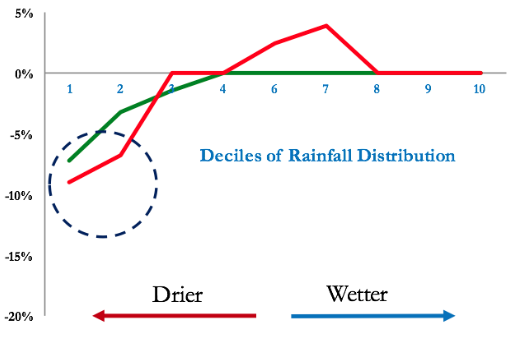 For example, the timing of rainfall can have significant effects on productivity. The availability of daily rainfall data allows us to explore this question quantitatively. Even after controlling for the levels of temperature and rainfall, each additional “dry day” during the monsoon (i.e. days with less than 0.1 mm rainfall) reduces yields by 0.2% on average, and by 0.3% in un-irrigated areas. What do these estimates mean for farmer incomes? An extreme rainfall shock (defined as rainfall in the bottom two deciles) reduces farm revenues during the kharif by 7% in irrigated areas and by 14.3% in un-irrigated areas. Similarly, an extreme temperature shock (defined as temperature in the top two deciles) reduces rabi yields by 3.2% in irrigated areas and by 5.9% in un-irrigated areas. a change in the number of dry days. The Inter-Governmental Panel on Climate Change (IPCC) predicts that temperatures in India are likely to rise by 3-4 degrees Celsius by the end of the 21st century (Pathak et al. 2012). Combining these predictions with our estimates imply that in the absence of any adaptation by farmers, such as change in cropping techniques or expansion in irrigation, agricultural incomes will fall by 12% on average, and by as much as 18% in un-irrigated areas by the end of the century. 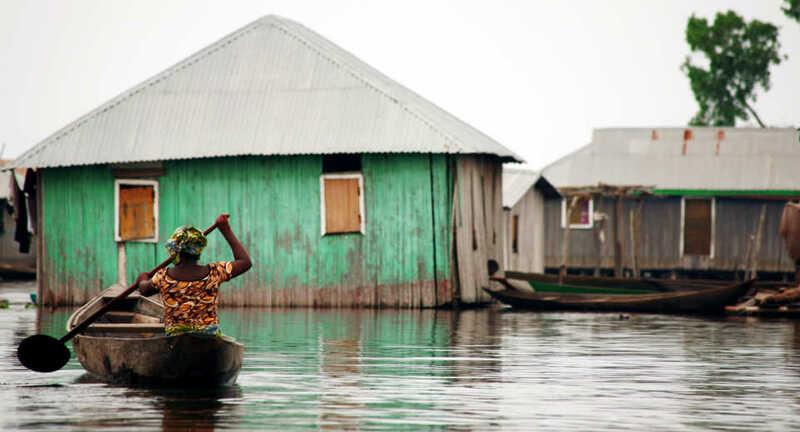 Climate models do not have clear-cut predictions for changes in average levels of rainfall. However, if we extrapolate from the observed decline in rainfall over the past three decades, farm incomes could decline by as much as 12% for kharif crops and 5.4% for rabi crops in un-irrigated areas. Most models of climate change predict an increase in the variability of rainfall, in particular, an increase in the number of dry days as well as days with extremely high levels of rainfall. Once again, extrapolating from the observed increase in the number of dry days over the past three decades, this channel alone could account for a 1.2% decline in farm incomes. Of course, it is likely that increases in temperature, decreases in rainfall levels, and increases in rainfall variability are correlated with each other. Back-of-the-envelope calculations suggest that after taking these correlations into account, climate change could reduce farm incomes by 15-18% on average, and by as much as 20-25% in un-irrigated areas. First, there is an urgent to need to spread irrigation. While significant progress has been made over the past few decades, the proportion of cultivated land under irrigation is less than 50% today – a lot remains to be done. The central challenge here is that this spread of irrigation needs to take place against the backdrop of diminishing ground water reserves, particularly in parts of north India. Second, research in agriculture technology needs to be stepped up in order to develop crop varieties and cropping techniques which are more resilient to the vagaries of weather. Finally, subsidies (power and fertilizer) that favour the indiscriminate use of water need to be rationalised and reduced, and support should instead be extended through non-distortionary forms such as direct transfers (as Telangana is attempting today). More generally though, the cereal- and sugarcane-centricity of agricultural policy must be reviewed and overhauled (Subramanian 2017). Burke M, S M Hsiang and E Miguel (2015), “Global non-linear effect of temperature on economic production”, Nature 527(7577): 235-239. Burgess R, O Deschenes, D Donaldson and M Greenstone (2017), “Weather, climate change and death in India”, working paper, London School of Economics. 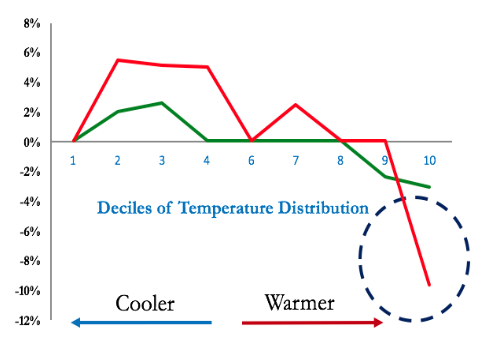 Dell, M, B F Jones and B A Olken (2014), “What do we learn from the weather? 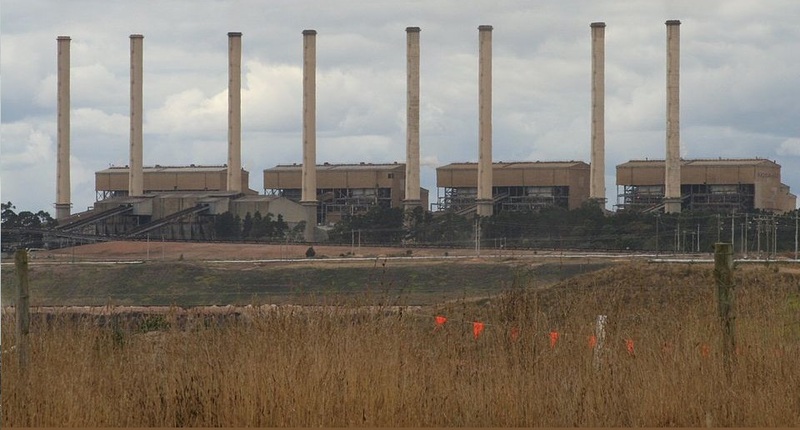 The new climate–economy literature”, Journal of Economic Literature 52(3): 740-798. Dell, M, B F Jones and B A Olken (2012), “Temperature shocks and economic growth: Evidence from the last half century”, American Economic Journal: Macroeconomics 4(3): 66-95. Deschênes O and M Greenstone (2012),“The economic impacts of climate change: Evidence from agricultural output and random fluctuations in weather: reply”, The American Economic Review 102(7): 3761-3773. 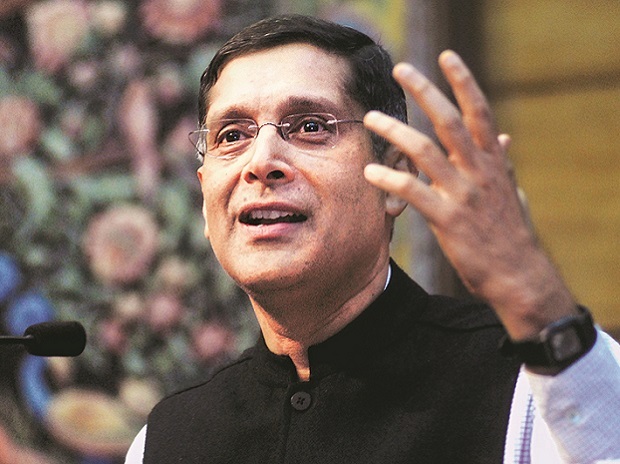 Government of India (2018), Economic Survey of India (2017-18). Guiteras R, (2009), “The impact of climate change on Indian agriculture”, mimeo, Department of Economics, University of Maryland. IMF (2017), World Economic Outlook: Seeking Sustainable Growth – Short-Term Recovery, Long-Term Challenges. Subramanian A, (2017), “Transforming Indian agriculture: By loving some agriculture less and the rest more”, Lecture at National Academy of Agricultural Sciences.